Brought to life by Oli Ashness who wanted to crack the age-old problem of how to slot healthy and delicious meals into a busy lifestyle - the launch of SimplyCook means that now everyone can be put in touch with flavoursome and convenient meals which won’t cost the earth. Calling for only a few fresh ingredients to use in rhythm with the unique spice blends as concocted by the chefs - each box is powerful and could include as many as 18 delightful ingredients so you really won’t find a more authentic taste like it. Each exciting cooking kit could contain culinary pastes, garnishes, infused oils, stocks and rubs as well as herb and spice blends - depending on what's on the menu - all delivered in the perfect quantities that you'll require to bring each meal to life, along with a simple recipe card to follow. Delicious and truly cost effective too, SimplyCook recipes will only set you back £3-£6, making them ideal to help you out when hosting a dinner party or small get together. Perfect to even gift another, choose a 3, 6 or 12-month subscription and let another who's rushed off their feet delight in this real cooking saviour! How do I use my Simply Cook voucher? Continue to set up your account and check out securely. Sign up with an account to enjoy a trial box and you’ll be able to have a little taster of what SimplyCook is all about with a subscription that you can cancel at any time! Can I choose what goes into my SimplyCook box? The SimplyCook chefs will pick your box contents initially, but should you fancy something else on the menu, you can send them an email or log onto your account to swap in recipes you’d like to try. Are there gluten-free options at SimplyCook? Indeed, you can find plenty of gluten-free box options and recipes to follow online. There is a whole page dedicated to customers who are over the moon with SimplyCook, check out the Testimonials for yourself and don’t hesitate to leave a kind word yourself! Is there a SimplyCook app? You can download the SimplyCook app via the Apple App Store or on Google Play to take your recipes and ingredients lists with you on the go! Delivery is with the Royal Mail, with 3 delivery dates per week. You can do this by logging in and going to your membership settings, simply click to stop your regular deliveries. Email - hello@simplycook.com and a live chat is also available. Office hours are 9:30 am - 6:30 pm Monday - Friday and closed weekends. For delicious meals in a matter of minutes - discover SimplyCook! Offering pre-prepared boxes of spices that you won’t find in your local supermarket - now you can add that pazazz to your food for less with a Simply Cook voucher from us. Whether you want to stay healthy with recipes that can easily fit into your lifestyle requirements, or if you want something new to wow guests with - try SimplyCook and take your cooking to the next level. 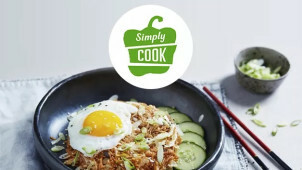 Check out the recipes section online to see what simple yet delicious meals can be made in as little as 20 minutes with SimplyCook. Here you’ll discover easy-to-cook global recipes which only require an additional 4-6 fresh ingredients. From Thai bites to risotto like you’d find in Italy, find light options too and you’ll always be sure to indulge in restaurant-quality food in your own home. The Discovery Box option from SimplyCook is a surefire way to tantilise your tastebuds! Introducing you to more than 50 meals that are inspired by worldly recipes, use a Simply Cook discount code and get on board to some real culinary delights. Whatever type of cuisine you’d like to try and whatever you’re in the mood for - you’re sure to find your inspiration in a Simply Cook Discovery Box.